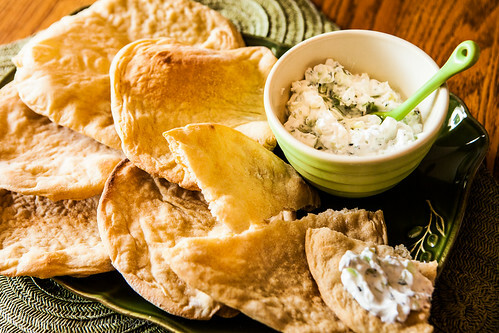 A favorite summertime snack – or sometimes it becomes a meal – is Tzatziki and pita. Cool, crisp refreshing, cucumber is always delicious, but especially so on a warm, sunny day. I don’t always follow a specific recipe but generally start with something like this version from Ina Garten. I may vary it depending on my mood or ingredients on hand. One major difference is that I always use Greek yogurt and it really doesn’t need draining. I made the pita you see in the photo and while they don’t look too bad, let’s just say I wouldn’t serve them to company. So I won’t share that recipe today but may have one for you in the future. In the meantime, good pita is easy to find in any grocery store. Place the yogurt in a cheesecloth or paper towel-lined sieve and set it over a bowl. Grate the cucumber and toss it with 1 tablespoon of kosher salt; place it in another sieve, and set it over another bowl. Place both bowls in the refrigerator for 3 to 4 hours so the yogurt and cucumber can drain. Transfer the thickened yogurt to a large bowl. Squeeze as much liquid from the cucumber as you can and add the cucumber to the yogurt. Mix in the sour cream, vinegar, lemon juice, olive oil, garlic, dill, 1/2 teaspoon salt, and pepper. You can serve it immediately, but I prefer to allow the tzatziki to sit in the refrigerator for a few hours for the flavors to blend. Serve chilled or at room temperature.